How An Average American Skier Managed To Scheme Her Way Into The Olympics : The Torch Elizabeth Swaney's two qualifying runs in the women's freestyle skiing halfpipe event on Monday raised questions about how she became an Olympian. She barely got any air, finishing in last place. Elizabeth Swaney of Hungary runs the course during the women's halfpipe qualifying at Phoenix Snow Park at the 2018 Winter Olympics in Pyeongchang, South Korea on Monday. It's not easy to qualify for the Olympics, but it might not require super-human athletic ability either. Take the case of Elizabeth Swaney: an American competing on the Hungarian team. Her two qualifying runs in the women's freestyle skiing halfpipe event on Monday left many viewers wondering how she became an Olympian. While she did one alley-oop, she didn't pull any spectacular tricks during her routine, barely even getting any air, and finishing in last place more than 40 points behind the 12th-place qualifier for the finals. To be fair, it's not that Swaney is a bad skier, but she's certainly not at Olympic caliber, says CBS Sports reporter Pete Blackburn. "It was a combination of determination and really gaming the system," Blackburn tells Here & Now's Jeremy Hobson. "The field is not very deep in the women's halfpipe, so she was she was able to enter events in which there were 30 or less competitors, and if you earn a top-30 finish in a World Cup event you score points through the International Ski Federation." After raising enough money through online crowdsourcing, Swaney was able to compete for two years and rack up enough points to qualify by performing very simple routines in several World Cup events– without falling. But at No. 34 in the rankings, her chances of reaching the Olympics were slim. There are 24 spots available in women's ski halfpipe for the Pyeongchang Olympics, but the maximum number of athletes each country can send to the Olympics for the event is four, according to NBC. Countries that dominate in women's ski halfpipe, like the U.S., can only send their top four skiers, even though they had six skiers who qualified. Some countries also didn't use all of their spots because they didn't have enough athletes that ranked high enough. Other skiers were forced to forego their spots due to injury. As a result, the list made it all the way down to Swaney. Even though the 33-year-old from California is an American, Swaney was able to compete for Hungary because her grandparents were born there. Before that she skied for her mother's home country of Venezuela. "That's not totally unheard of," Blackburn says. "A lot of athletes do that, where they grew up in one place, but they represent another country because it actually increases their chances of going to the games. But those athletes are usually higher skilled and sort of world class athletes." While some considered Swaney's appearance to be harmless, critics say she made a mockery of the Olympics and knocked out legitimate athletes. Others argue she manipulated a flawed qualifying system just to say she was an Olympian. "It's not some adult Disney world where you go to take selfies," one commenter wrote on Swaney's Instagram account. "The Olympics are a showcase of the BEST athletes in the world and Swaney made a mockery of that. She made a mockery of people's life work. She made a mockery of halfpipe skiing in general. She did this so she could flaunt the title of Olympian. Unbelievable." The Hungarian Olympic Committee also told Reuters that the incident has prompted it to reevaluate the selection process. "We, the Hungarian Olympic Committee, have to learn the lessons from this case, and we must consider rethinking our nomination procedures," a Hungarian team spokesman told Reuters via email. While Swaney's road the Olympics is unusual, it's not uncommon for athletes to lack the world-class talent that is expected of most Olympians. Tonga's Pita Taufatofua – who notably marched through the frigid opening ceremony shirtless – finished 114th in in the 15km cross-country skiing event after skiing on snow for just three months. Others have criticized Swaney's Olympic dreams as the latest in slew of unusual, somewhat unrelated pursuits. When Swaney was 19, the Harvard graduate ran an unsuccessful campaign for California governor, losing to Arnold Schwarzenegger. 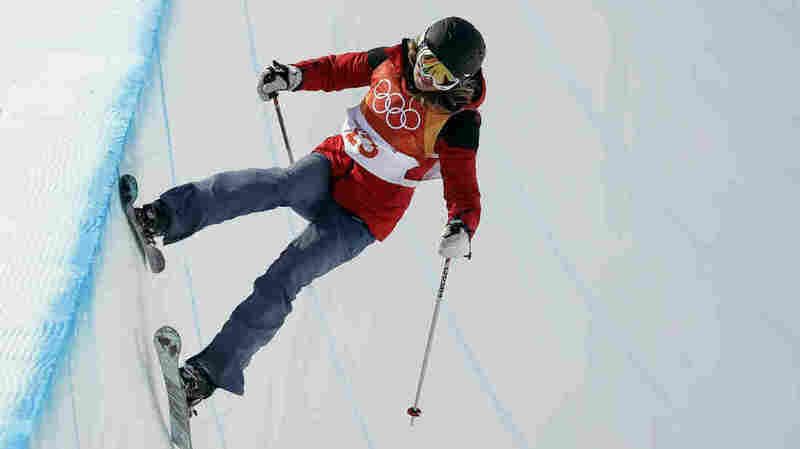 The AP notes she only started skiing eight years ago after she failed to qualify for the Olympics as a skeleton racer. "I want to show others that freestyle skiing is possible and it is never too late to get into this sport, and to help others to dream and to progress the sport in Hungary," Swaney told Reuters on Monday. "I hope this can be a platform to inspire others."